A true Korean beauty innovation and a must-have in any beauty arsenal to help blemishes disappear quickly. See a breakout about to happen or already have a spot? These wound protectant patches use hydrocolloid (cellulose gum) to actively absorb breakout secretions and quickly help reduce blemish size. They are also perfect for daytime or nighttime use, clear dots are barely noticeable and make-up can be applied over them. Helps blemishes disappear quickly and effectively acts like a protective cover over the treated area. Diminishes distressed appearance of blemished skin. Cellulose Gum 30% - Acts as an Absorbent. Cleanse the area to be treated. 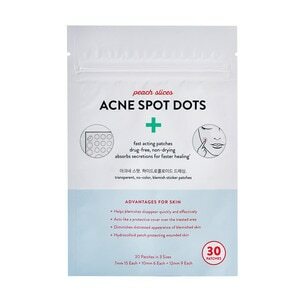 Select a dot-shaped patch that is larger than the acne blemish, and adhere the patch over the area to be treated. After 8-hour, remove by gently peeling back and discarding. Cleanse the treated area and apply another patch if desired. Keep out of reach of children. For external use only. Do not use on damaged or broken skin. Stop using and ask a doctor if rash and/or irritation occur. When using this product, keep out of eyes. Rinse with water to remove. If product is swallowed, get medical help or contact a Poison Control Center right away. Protect the product in this pouch from excessive heat and direct sun.